Note: This is for new drivers who are not currently active on another ride-hailing platform. If you are currently driving on another ride-hailing platform, please click here to learn about our special incentive for you. Have you always thought of driving with Grab? Do you want to earn more? Become a Grab driver partner this March and earn more than ever before – up to $1,060 a week for your first 4 weeks in incentives! How does these incentives work? Up to $1,060/week in incentives for the first 4 weeks with Grab. You could earn a total potential of $4,280 in incentives…AND this is on top of your own earnings. [Cash Bonus] If you are driving your own car or sharing a ride with your referee: Upon activation, complete your first trip before the following Sunday and be rewarded with a cash bonus. But that’s not all, our multi-tiered incentive gives you the flexibility to choose how much you want to drive and earn. If you have time, try for the higher tiers. But even if you don’t, you will still be rewarded for your effort! 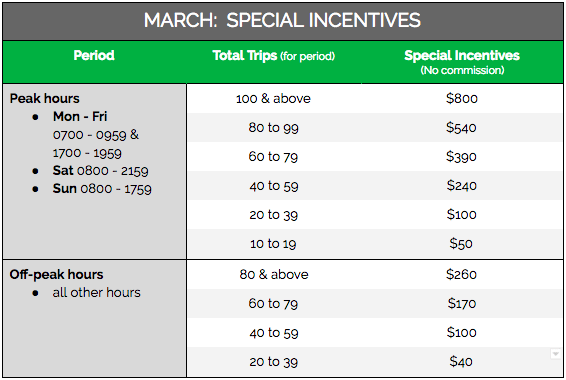 This table shows incentives that are specially created for new drivers who are not currently active on another ride-hailing platform. AR (acceptance rate) must be above 85% and CR (cancellation rate) must be below 10%. First-Trip Cash Bonus: Paid in CASH if you complete your first trip before the following Sunday after account activation. Welcome Credit: Paid upon account activation; (i) $100 Welcome Credit & (ii) $50 valid TDVL & (iii) $100 ACRA Owner (for Own Car only). Applies to GrabCar Economy 4 & 6-seater, GrabCar Premium, GrabShare & GrabFamily unique passenger trips only. In registering for this incentive, the participating driver acknowledges that: he/she has read and understood the terms of his/her existing rental agreement with any other vehicle provider and confirm that by participating in the scheme, they are not in breach of any obligation under the rental said agreement; the vehicle they will be using for the scheme is not subject to any restriction that prohibits the vehicles from being used for purposes of the scheme; & he/she has not informed Grab nor is Grab aware of any reason that would disqualify the driver from participating in the scheme.